NEEDTOBREATHE is a GRAMMY-nominated rock band hailing from South Carolina, comprised of brothers Bear Rinehart (vocals, guitar) and Bo Rinehart (guitar, vocals), Seth Bolt (bass, vocals), and Josh Lovelace (keys, vocals). Their most recent album H A R D L O V E released in 2016 and debuted at #1 on the Billboard Top Albums, Top Current Albums, Top Rock Albums and Top Alternative Albums charts and #2 on the Billboard 200, their greatest debut yet. H A R D L O V E is the follow-up to 2014’s Rivers In the Wasteland, which debuted at #3 overall on the Billboard 200 and spawned the RIAA-certified Gold single “Brother (feat. Gavin DeGraw).” The hit earned the group their first GRAMMY nomination as well as a pair of Billboard Music Award nominations. NEEDTOBREATHE, well known for the aggressive touring schedule and impressive live show, celebrated four consecutive sold out shows at Red Rocks Amphitheatre, as well as sell outs at Greek Theatre (Los Angeles), Ascend Amphitheatre (Nashville), Aragon Ballroom (Chicago), Verizon Theatre (DFW) and more. 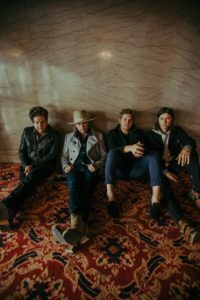 NEEDTOBREATHE recently released their 4-track EP Forever On Your Side (Niles City Sound Sessions) – which includes the single “Forever On Your Side (with JOHNNYSWIM)” – debuted their first ever fully acoustic album – Acoustic Live Vol. 1 – in November of 2018. For more information, visit www.needtobreathe.com.